50g - Glass Bubbles are hollow glass spheres with a more variable particle size than micro balloons. Being composed chemically of glass, they are physically harder than micro balloons and filled resin mixes are noticeably more difficult to sand. However, glass bubbles produce a more waterproof filler mix and are often used on below-waterline applications on boats. Being significantly less expensive than micro balloons they are often preferred if easy sanding performance is not of prime importance. They can be mixed with micro balloons in any proportion for colour purposes. 50g - Microfibres are very fine wood-cellulose fibres commonly used to create structural adhesives for bonding both wood and grp. Because any low viscosity resin system is readily absorbed into a porous surface such as wood, an unfilled adhesive may tend to give a ‘dry joint’. With their absorbent properties, microfibres can retain a significant quantity of adhesive within a joint and limit resin absorption into the surrounding surface, thus ensuring an adequate resin supply for adhesion. Where the strongest bond is required, e.g.. timber scarf joints, microfibres should always be used in preference to hollow sphere-types of filler. For bonding parallel to the grain with lower density, lower strength timbers, such as cedar or obeche, a micro balloon mix is often adequate, and is of lower density. 50g - Micro Balloons are hollow phenolic resin spheres which have a distinctive reddish/brown colouration. This makes them particularly useful for cosmetic fillet joints and fillers in wood construction, as well as structural adhesives for less demanding applications on softer timbers such as cedar. Although not as waterproof as glass bubbles, micro balloons are often preferred for their excellent sanding characteristics. Micro balloons are not normally used with polyester or vinylester resins because they can be subject to styrene attack which may cause the spheres to collapse. When storing micro balloons, it is particularly important to exclude air as they readily absorb atmospheric moisture which will affect the performance of the filled mix. 25g - Silica is an agent which is used to control the thixotropy or ‘sag’ characteristics of a resin system. 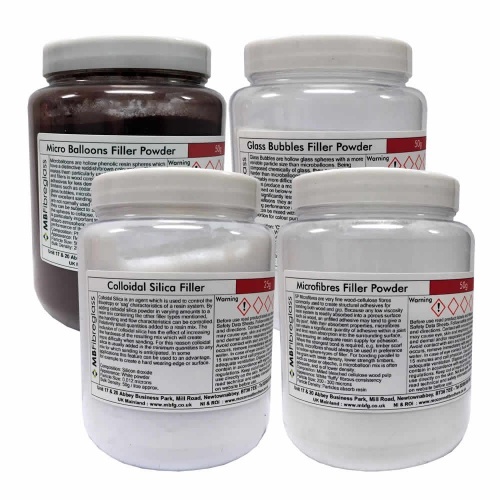 By adding colloidal silica powder in varying amounts to a resin mix the handling and flow characteristics can be controlled. Relatively small quantities added to a resin mix containing glass bubbles or micro balloons will give non-sag properties and impart easier handling. Silica is also used with microfibres to produce a mix suitable for use as a high strength, non-sagging structural adhesive, particularly for non-absorbent materials such as grp. The inclusion of colloidal silica has the effect of increasing the hardness of the resulting mix which will create more difficulty when sanding. For this reason silica is usually added in the minimum quantities to any mix for which sanding is anticipated. In some applications this feature can be used to an advantage, for example to create a hard wearing edge or surface.